You have got a Mule XML as well. Envy. Last edited by shado; 06-22-2011 at 10:21 PM. Whoa whoa! This is gonna be good! Both had fresh AW's and set on high from about 6 feet away. Last edited by shado; 06-28-2013 at 03:59 PM. Thanks Todd for your beamshot. Can't make any diffenerce for me now. Just ordered a Haiku XML BB. Wow! Don was right, significantly more flux with the XM-L! Thanks again Todd for the effort. The tint is pretty nice as well. I think maybe if my XM isn't traded by the time I get home from work today I might just sell it outright so I can fund an XM-L flavored Mule! The Mule XM-L looks nice, but given the lack of range the Mule has, it seems like using it to produce high-quality light is still the more useful application. I use mine for photography on a regular basis. Shado, do you run a one or two cell mule xm-l? do you find that the low level is not too bright for dark adapted vision? Do you find the mule's flood beam useful for your specific applicatrions some occasions? I had a non mizer mule pd once and it was great but heated up too quickly on high, whereas I like to be able to safely leave a light on high until the battery runs out without fear of damaging the led or electronics. email sent for Haiku XM-L w/ 1x123 McClickie Pak. Got mine yesterday. My first McGizmo...very, very impressive. Can somebody help me with some guidance, I am a few years out of the loop and would be pleased on which choices there are to be made for these Mule XM-L lights, from what the last one I had was 2 level with a twist, so to get multi level, I would have to get a 2 x 123 with the BB? oh yes and are these still for sale? This is Don's thread for the Mule sale with HI CRI emitter, and you are presently in the wave thread for the XM-L light. I think any of Don's LEs whether Nichia, XP-G warm, XP-G cool, or XM-L will work in the Mule, but the XM-L is a very good choice if you want bright! and don't mind a cooler tint. The Mule comes with a 1x123 Clicky pak like the Haiku and Sundrop, but I think it CAN be had with a 2x123 Clicky pak if you want, and in that case you need one of the 6v LEs. ... so to get multi level, I would have to get a 2 x 123 with the BB? The driver for Don's current offerings is 3 mode in which you change output levels by quickly pressing the clicky. So, you don't need to get a 2x123 Clicky pak in order to get the three modes; you get three modes with the 1x123 pak as well. Hi Don - sent an email for a 6V Haiku XML this afternoon! Thanks! Shipping notice received - Paypal sent - can't wait to receive this latest ti McGizmo masterpiece! Thanks, Don! Mule XML safely arrived today .it is soooo beauitful ...I like it very much.thank you so much Don.!! can anyone tell me how to just my Mule to low,mid ,and hight ?????pls. With the light on, switch it off and on quickly by clicking the switch, and it will go to the next level. You can cycle through like this to get to the level you want, then just leave it on. If you turn it off it will remember the level you were at and come on at that level again. Email sent for a Haiku XML 6V. Thanks. About the feeling that you get when a new McGizmo shows up from Hawaii...ahhh. Don, the Haiku 6V XML is an absolute beauty! "Punchy flood" is how Policescannerman described the Haiku XPG when it first came out - okay, take everything good about the Haiku XPG and double it. That's what my sphere says about brightness - with 2 AW RCR 123s I get 371 lumen from my brand new 6V Haiku XML, and the same punchy, floody goodness, only with a larger 'punch.' Man, is that huge chunk of titanium gorgeous. I won't clutter this thread with more than these two comments, but I also was fortunate enough to receive a 6V Makai XML from Drywolf today (thanks, Frank!) 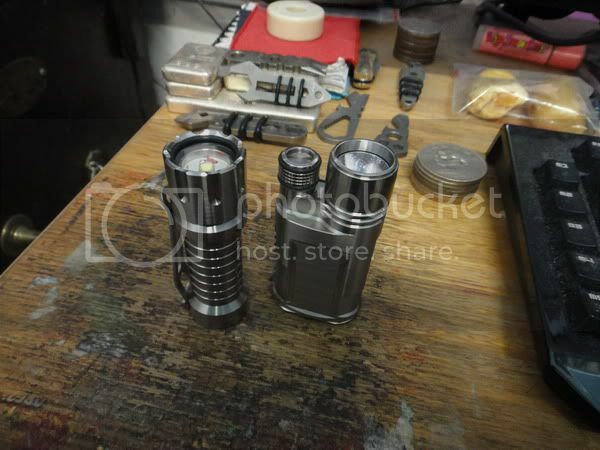 - also 370 lumen, but with a more intense spot. Just gorgeous. For those of you who know me, my love of Don's lights is no surprise. I admit that I've recently been on an "all things incan" obsession, and in so doing have seen my love of the Gizmos get pushed into the background (although it never went away.) My Haiku XPG and BB XRE have been with me longer than any other lights that I own, except for a beat up old Surefire 6P. 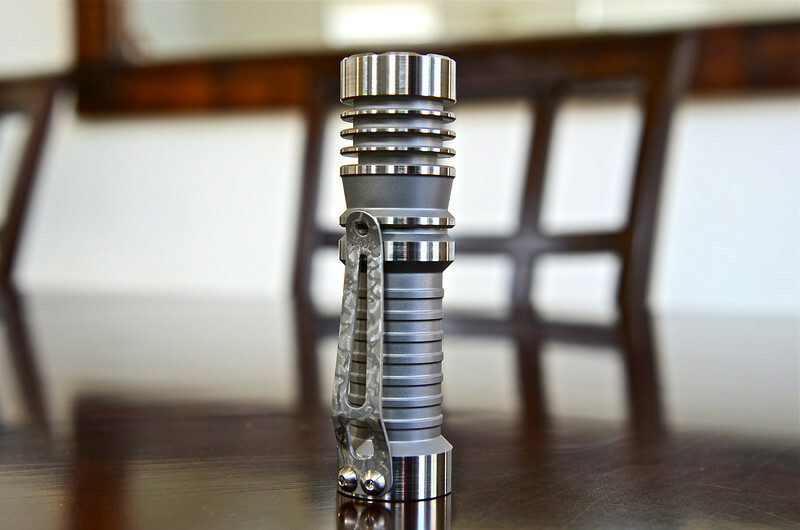 But they still bring about smiles, and although I will continue to enjoy my incandescent lights, I believe a Haiku will once again find its way into the regular EDC rotation, with the Makai providing the light for early morning dog walks. Oh, sure - there will be an incan in the lineup regularly, but the only 'custom' LEDs that I still own, my McGizmos, will remain in the lineup. I feel compelled to resurrect these two old threads, (here and here) both of which surely convey my appreciation for Don's talents and craftsmanship more than any words I'll type here. I will add that I sold a custom knife and 7 incan lights to fund these two purchases, and it was worth it! I sent you an email for a Haiku XML yesterday, Thanks! Last edited by LumensMaximus; 09-05-2011 at 07:16 PM. Finally recieved my first McGizmo. Thanks Don!